2018 - After years of research, stemming from this blog post, we decided to continue helping pets with CBD solutions. Learn more here. Orange is the new black and hemp just may be the hip new cannabis. How outrageous is that? More to the point, what does hemp have to do with dogs and nutrition? There are a lot of myths, misnomers, and controversies we need to discuss. It’s become a hot issue being debated by veterinarians around the world. We feed our pup hemp seeds some mornings because it is the only plant in the world that is a complete protein. We recently met with one of our suppliers who informed us of epileptic dogs receiving medical marijuana as treatment. This peaked our interest and so we began to research this new field. We wanted to share the highlights of what we have learned so far. Let’s start by answering the million dollar question up front. Is hemp marijuana? No! Hemp is not marijuana. To better understand the difference, we need to get botanical. Hemp and marijuana are different varieties of the same plant species Canabis Sativa L. It’s like how dogs and wolves are different breeds of Canis Lupis. They are related but differ in scientific make-up and how they are cultivated or bred. For example, hemp is made to grow upward like bamboo (10-15’ high) specifically for its stalks and seeds which are used for textiles, food, paper, body care products, plastics and building materials. That’s why it’s most often referred to as “industrial hemp”. Marijuana, on the other hand, is grown out like a bush to cultivate the leaves and cannabis flowers used for medicinal and recreational purposes. David P. West, PhD of the North American Industrial Hemp Council and renowned commercial corn breeder explains that a biochemical method further classifies Cannabis plants by their unique molecular compounds called cannabinoids - the most common being CBD and THC. Marijuana is low in CBD and contains 5-10% THC which is the psychoactive ingredient that gives a “high”. Industrial hemp conversely is high in CBD and has a low .3-1.5% level of THC and considered non-narcotic. The Cannabis College of Amsterdam attempts to inform the public on all aspects of cannabis and hemp. Hemp has the ability to leach radioactivity from the soil and prevent erosion and mud slides. Hemp plants mature in just 4 months vs. 20 years for trees. One acre of hemp produces as much fiber pulp as 4.1 acres of trees. Plastics made from hemp are biodegradable. Hemp is rarely affected by pests or disease. While grown worldwide, its major producers include Canada, France, and China. The US government doesn’t recognize the differences between industrial hemp and marijuana so cultivation has been prohibited since 1950. Prior to 1937, there were more than 10 million acres of seed-laden hemp growing wild in the U.S. and considered a primary link in the food chain. But a recent change in federal law will now allow for colleges and universities to grow hemp for research. That means that after 50 years on hold, America can get on track to once again become the predominant manufacturer of hemp. Scientists believe that there are five centenarian hot spots on earth: Sardinia; Italy; Okinawa; Cost Rica and the village of Bama Yao in China. Here people live 100+ years without health issues not just because of clean air and water but the commonality in their plant-based diets rich in hemp seeds. Today, 40% of Americans buy organic foods and hemp products are in their grocery carts. They have gone mainstream sitting on shelves next to flax and soy and appearing in the form of hemp oil, butter, salad dressings, nutrition bars, breads, cookies and even personal care products like soaps, shampoos, and lotions. Exceeding $581 million in 2013 annual sales according to SPINS market data and The Hemp Industries Association (HIA), hemp is among the fastest growing categories for food and consumer products in the U.S.
Of the 3 million plus edible plants in the world, no other plant source compares with the nutritional value of hemp seeds. Called the “complete protein” they have the ideal ratios of essential oils and amino acids needed to ward off immune type diseases AND they are the highest source in the plant kingdom of essential fatty acids responsible for the luster in skin, hair, eyes, and even thought processes. They’re a great diet supplement for people allergic to soy, containing about 11 grams of protein in a single tablespoon. Hemp provides 50-75% more protein than either flax or chia. Hemp seeds have a taste and texture similar to chopped walnuts. Hemp seed meal or cake is the product that remains after the seeds have been crushed and the oil extracted. It still contains 25% protein and can be made into milk, cheese, non-dairy ice cream, burgers & anything soy can be made into. Further milling of the meal turns it into hemp protein flour used in making breads, pastas, pancakes… and even beer. If you sift the meal even finer which removes most of the fiber – you have hemp protein. Hemp seed meal or cake was one of the world’s principle animal feeds until this century. It has the advantage of providing a complete diet for a lesser feed cost and allows animals a maximum weight gain without any need for artificial growth steroids. The good fat in hemp seed oil is unique since it is approximately 80% polyunsaturated or “good” fat – the highest of any vegetable oil. These fatty acids can’t be produced by the body and therefore must be obtained from our diets. That’s why hemp seed oil as a supplement or ingredient in dog food is showing great promise as is hempseed meal as an addition to both small and large animal feed. The protein in hemp is easily digested and could possibly be an alternate or supplemental source of protein in the food but more research is needed. While the movement toward incorporating hemp into a pet’s diet is still in its infancy, veterinarians are slowly starting to discover the value of this miracle plant. Most dog foods are like “fast foods” for humans - without all the nutrients and only made to taste good. Hemp seed oil is better than fish or flax seed based oils because it naturally has the perfect Omega 6 to Omega 3 ratio ( 3:1 ) of fatty acids which your dog needs. Hemp oil moisturizes a dog’s skin and fur correctly because it is herbal and has virtually no side effects like fish oil - but it must be administered in the right quantities. Hemp seed oil prevents dog’s skin disorders such as dry nose, dog acne, dog eczema, dog rash and dog dandruff. Hemp seed oil can enhance blood circulation and stimulate a dog’s cognitive thinking. Plus, it can thicken its fur texture and lessen shedding. Again, because hemp oil is extracted from the “industrial hemp” plant there are no psychoactive reactors. Before buying hemp products for yourself or your pet, check out where they are grown and manufactured to ensure you are getting the best quality. While there are lots of brands to choose from, Canadian hemp products must meet tough standards. They are “identity preserved” in lots equivalent to “certified organic.” Every lot can be traced to its source. Health Canada only allows hemp to be grown with a government issued permit and requires mandatory lab testing to ensure that all hemp grown there contains 0.00% THC. Canada’s primary market for hemp is the U.S. Cylab International will open a new $32 million hemp processing factory in Alberta by 2015 with others like Stemia ready to do the same. They’ll both manufacture everything from dog bedding to bio-fuel. One Canadian company that brands its products as HEMP HEARTS™ uses no pesticides, insecticides or chemical preservatives. They are not irradiated, pasteurized or altered in any way from their natural state which might compromise their food value. There’s also enough Vitamin E to keep them from going rancid. As always, make sure your vet is aware of any supplements that you give your dog or plan to give. While they may be safe, it may interact with a medication or factor in diagnosing an issue your dog may be having. It’s also important not to over supplement which may make them sick. Since the oils in hemp seeds go rancid rather quickly, they are kept in the refrigerated section of natural food stores. Be aware that heating hemp seeds will destroy the nutritional benefits of the fatty acids so add them to foods after cooking. While generally considered safe, here are some side effects to be aware of. Because of the high fat content – even though it’s the good kind – it may cause diarrhea. Start with approximately 1 tsp per day and work your way up to the recommended 2 tablespoon serving. As of 2011 hemp seeds were not known to interact with common medications – but consult your physician before introducing them into your diet. Blue Shield of California cautions anyone taking anticoagulant drugs since hemp seeds inhibit platelets and may pose a bleeding risk. Now, let’s talk about the elephant in the room: medicinal marijuana for dogs. Dr. Katherine Kramer, a vet with British Columbia’s Vancouver Animal Wellness Hospital, says, “The topic of marijuana for pets is becoming more and more popular. Two years ago pet owners would ask about marijuana once a year. These days, I get asked at least once a week.” Even the American “Veterinary Medical Association” website carries testimonials favoring veterinary cannabis. But the real question is should you be giving it to your pet? Should your vet? Research has not yet established safe dosing guidelines for dogs or humans partly because of highly restrictive federal laws that prohibit scientists from thoroughly investigating its effects. But Georgia, a 5-year old Cavalier King Charles Spaniel is a medical marijuana patient. Her owner has said “it hasn’t cured her syringomyelia, a serious neurological disorder but it seems to have helped her pain and anxiety when traditional Western medicine wasn’t working.” http://www.cnbc.com/id/101732379#. World renowned veterinarian Dr. Colmery shared his opinion about alternative food supplements. "If you put a shoe, a can of WD40, and a chicken feather in a box you could call it the perfect protein," he said. “There's cartilage from the hide, fat from the oil, and protein in the feather. But, it has no nutritional value because you can't eat it." He said that before he could classify hemp as the single perfect protein, he needed to do more research. "As far as I know, the only single source protein with all 11 essential amino acids is "man himself". When UCLA’s Dr. William Eidleman & R. Lee Hamilton, Medical Researcher &-Biochemist were asked about the "life giving values" of cannabis hemp they said, "the promise of super health and the possibility of feeding the world is at our fingertips." Picking up on that idea, a Richmond, Virginia entrepreneur opened The Hemp Dog Café selling hot dog buns made from hemp seeds, oil, & flour. And, if that’s not alternative enough, Push Designs just recently built a house in Asheville, NC using a product known as Hemcrete – a mix of industrial hemp, lime and water. This building material has been used in Europe and Australia since the 1960’s and dates back to 1,000 years to Asia and the Middle East where the Cannabis plant originates from. Its durability is unlike anything except stone and has a 600-800 year life span. "We tell folks they would have to smoke the master bedroom to get high! It would take smoking 2500 lbs of hemp, so it is a losing effort." Sounds kind of funny and far-fetched but who knows. Someday someone might do it for a Guinness world record! Until then, pet parents should do their own research and decide whether hemp is a good food supplement for their dog. Hemp was used in the construction of the great pyramids. It was legal to pay taxes with hemp in American from 1631 until the early 1800’s. Refusing to grow hemp in America during the 17th and 18th centuries was against the law. 90% of all ships’ sails and rope were made from hemp. Henry Ford built a plastic car comprised of hemp materials. Hemp can produce bio-fuel and ethanol better than corn. Salmon Slices are grain and gluten free. What are some of the other unique properties of the treat? We love Salmon for the omega-3 fatty acids it contains. They are good for your pups skin and coat while providing support for their immune system. We started by crafting our own jerky for this recipe and then used a grain and gluten free base. We choose Bob’s Red Mill Almond Meal/Flour because it is low in carbohydrates, grain free, and high in fiber. Fiber can help sugars in the pup's from crashing. We also added some unsweetened coconut flakes (sulfur/preservative free) and coconut oil. Coconut has benefits for not only your dogs coat but digestive track since it is rich in fiber. Most of the saturated fats in coconut oil are Medium Chain Triglycerides (MCT’s). They help the body digest nutrients efficiently. Coconut oil also contains 50% lauric acid (the only other source for this high amount is in breast milk) which has antibacterial, antiviral, and anti-fungal properties. Below is a short video by Chicago’s own Karen Becker talking about the benefits of coconut oil. Lastly we added a high quality little super seed known as black Chia (gluten free). It is non-allergenic. Chia seeds are an excellent source of phosphorus, potassium, copper, iron, and zinc. They contain more calcium than whole milk, more iron than raw spinach and more magnesium than broccoli. They even trump salmon by having triple or more Omega-3 fatty acids! We want to thank our monthly subscribers for allowing us to create unique treat experiences for many pups. This special treat has been receiving great feedback! Stay tuned to find out how we are bringing it to more than our monthly subscribers. This month’s treat was all about Purple, Yams that is! We used purple sweet potatoes known as Okinawan in their native Hawaii. They are touted as a powerhouse of nutrition and you can find many of the benefits here. The purple pigment provides more than just color. It is a byproduct of the antioxidant Anthocyanin. The Okinawan potato contains 150 percent more antioxidants than blueberries. We paired the purple potato with pumpkin seeds. They a great source of protein, amino acids, fiber, iron, copper, phosphorus and magnesium, calcium, zinc, potassium, folic acid and niacin; all important nutrients to your pet’s overall good health. When feeding them please make sure they are raw and unsalted. An interesting fact we also learned about is they are being used as a holistic approach to treating worms in your dog. We combined jerky, yogurt, and an egg to provide extra protein for your pup. We do keep it simple below is the complete ingredient list. 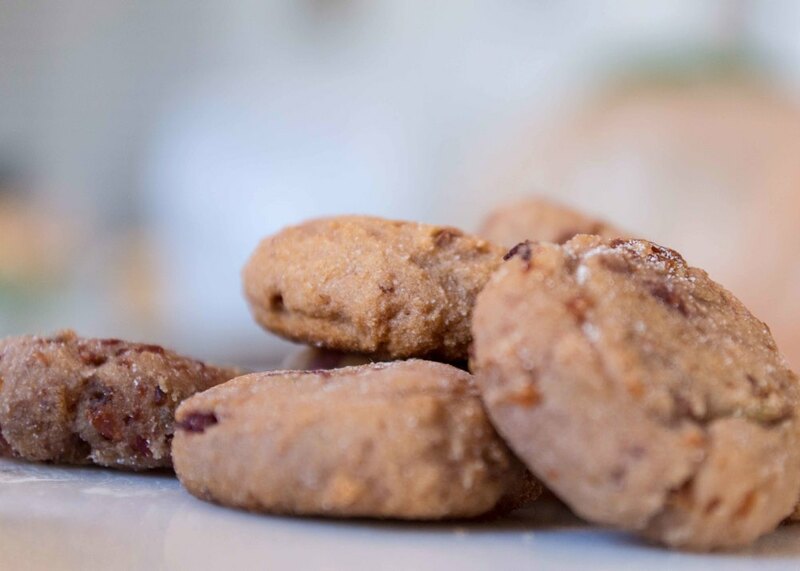 “Sweet potatoes are cooked with the skin produces more fiber than a serving of oatmeal"
We also sent some our customers another version that we made with organic Buckwheat Flour instead of Rice Flour. Buckwheat is a nice grain free alternative for dogs on special diets.